Indzola is now offering Ms Rinku Sobti collection of dresses. Ms Rinku Sobti is very talented versatile designer in Indian Fashion Industry. Indian fashion is synonymous to Rinku sobti. She is one of the leading designer who has created magnificent contemporary designs with her unique creativity keeping considerations of ancient tradition in India. The wardrobe consists of swimwear, eveningwear, and traditional Indian wear, specially the bridal outfit of sarees and lehengas, casual wear. She has made perfect combination of style, tradition and dignity of women which are reflecting her design and uniqueness, she has been also the designers of the gowns and dress of the Lakme Fashion Week. Now Indzola is also selling India’s best designer dresses by RINKU SOBTI FASHION PVT LTD, buy online from Indzola. Her designs and collections are used by most of the Bollywood celebs. 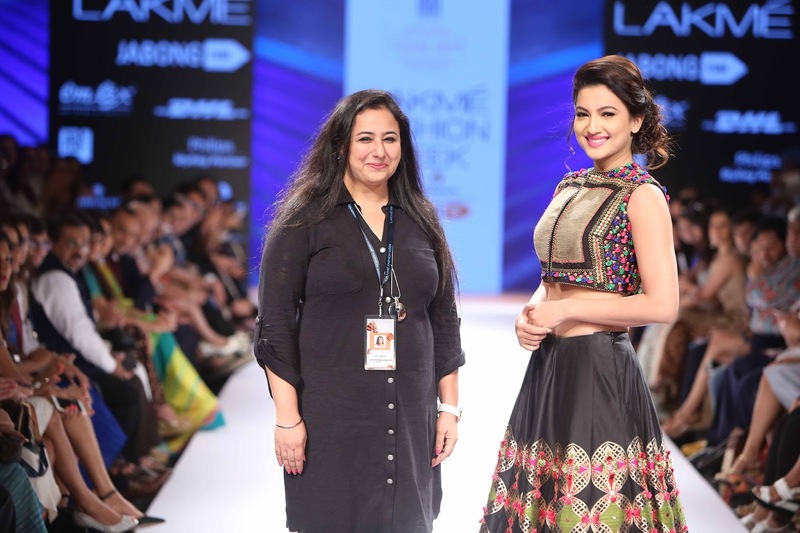 Recently Actress Gauhar Khan is set to walk the ramp for Delhi-based fashion designer Rinku Sobti on Indian Textile Day at the Lakme Fashion Week (LFW). The designer draws inspiration from the rich Indian handloom culture that prevails and the intricate works of the weavers in the Bajardiya cluster to shape her collection ‘Tassels’. 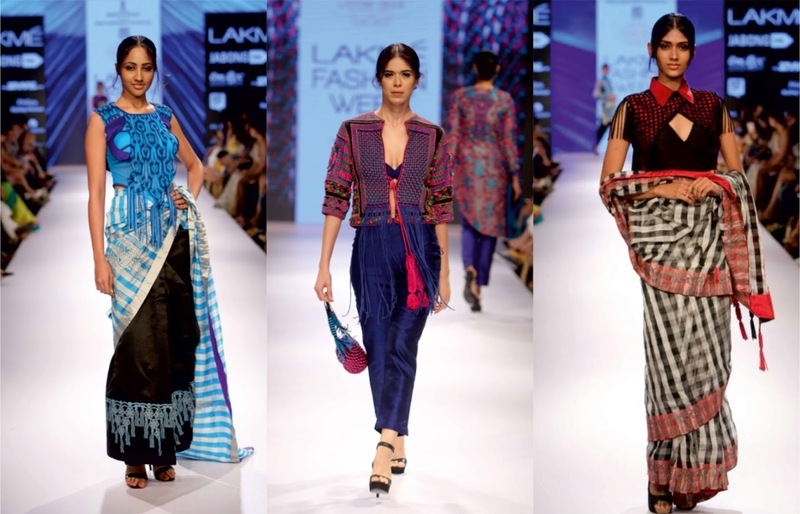 The creation is an ode to the handloom tradition and skilled weavers of India. The Beautiful Sunny Leone in a red coloured dress by Rinku Sobti. The handwoven dress features grape motifs all over and a stylish wrap detail. Also, Lakshmi Manchu was seen wearing Black and White check handloom Saree with maroon block printed border paired with maroon and black shirt collar macrame blouse. Designer Rinku Sobti brings in her SS16 collection – “Essenza” – inspired by fruits and handlooms of Varanasi. Dauntless yet elegant, this collection is for every woman who loves to embrace their feminine side with confidence. Beautiful designer dresses top party wear Designer outfits. These dresses are available at indzola in exclusive designs and are applicable for casual or formal wear. We presents TUNICS and Embroidery work dresses in various designs and color combinations. These dresses can be worn on any occasion ranging from casual wear to formals and party collections. Rinku sobti hold years of experience in offering a qualitative range of Designer Short Kurta, which is available at indzola in various sizes, designs, colors and patterns. These kurtas are manufactured by experienced fashion designers in accordance with the current fashion trends. This elegant & classy tunic is highly appreciated by clients for its unique embroidery and neat stitching. We care about you. We want to help you get these high quality dresses at the cheaper price. We are offering the best and renowned collection designed by Rinku Sobti dresses on INDZOLA. That’s not all… We will add special deals on our summer collection. Enjoy these exclusive traditional handloom RINKU SOBTI’S dresses collection and our deals. Enjoy savings. Indian women clothing not only provides comfort and style but is the best reminiscent of luxury and grandeur. Young girls are now on a lookout for ethnic outfits to experience a resplendent past transforming our cultural roots. Indian women dresses, be it Anarkali salwar suits or the best women cotton suit India, are well-defined and unique in its own way and these outfits looks graceful as these are worn with high spirit and pride Additionally, modern tunics, stoles or shawls are an ethnic grab with a fine touch of contemporaneity that has provided a new meaning to conventional Indian women dresses. These days, Indian cotton suits are very much in demand and accepted all over the world. These outfits look decent, versatile, stylish, fashionable yet modest. Every suit design will add grace to any woman’s wardrobe. There are plenty of reasons for which ladies like to shop their wearing stuff online. For example- Shopping ladies suits online India provides them an opportunity to shop as per their comfort and convenience. When any girl shops online, she can enjoy exploring many online stores without disturbing her schedule at all. Another reason is electronic retail shopping lets them to compare the prices as well as indulge in research without moving out of the home or office. What Do Women Mostly Shop For? Women and girls, most of the time, buy their personal use products from e-store, right from clothing such as Kurtis and suits to lingerie and footwear. Besides, they look for the best deals and discounts on clothing, gifts, cosmetics, bags, and footwear. Thankfully, there is a lot of websites to fulfill the increasing demands for the feminine stuff. Apart from this, the free home delivery facility, provided by many stores, further expands the appeal of e-shopping. So, the women will always look up at the websites to find the best deals. When it comes to the prices, online shopping scores high as well. Unlike physically placed shops, e-stores don’t have to incur huge expenses in order to maintain their stores So, providing huge discounts and offers on their products is their key tool for luring more and more people. No doubt that every woman has a passion for savings and e-retail shopping eases this job. With so many varieties of online women wear & accessories India, it has now become very difficult to go to each shop to find the best one. You should try to get it from popular online store where you can get it at a very reasonable price. Modern women prefer to wear Kurti at office or home with legging. The best thing about the Kurtis is that they are loose and so does not need to cover dupatta. Therefore, those who prefer clothes without hassle, they can choose Kurtis of their choice. These Kurtis are loved by women of all ages. This beautiful Kurti with regular fit will enhance your curves as well as will keep you comfortable. The Black Colo color of the cotton Kurti keeps Kurti subtle and very elegant. Multi-color printed wings Kurtis are great for wearing to college or to go shopping. If you like to wear Kurtis style of dress, then this Blue Color Printed Denim Kurti With Embroidery is sure to make you go crazy indeed. If you love your arms covered instead of being exposed to the sun then ensure you wear one of full sleeve Kurtis or three fourth sleeve Kurtis with legging. There are a lot of designs and patterns of Kurtis available in the market. Also, the best thing about these clothings is that they are not expensive and are cheaper in prices as compared to the other ethnic dresses. Therefore, the Kurtis made up of cotton and Georgette are very much in demand during summer and monsoon seasons. But if you go for shopping them in your local market, you will end up buying some common designs which are available in various shops in a particular market. So, you can choose the option of doing online to void this as many online stores provide attractive offers and discounts from where you can buy best women Cotton Suit India. Cotton suits and kurtis are very comfortable for both summer and monsoon season, because cotton is a skin-loving fabric as well as it protects the skin from infections / bacterial infestations caused from sweat. You can buy cotton Kurtisthrough various online clothing stores after doing some research about the store. Cotton suits and Kurtis come in all shapes and sizes. Their styles are well made and can be worn by women to functions or college. One of the most required things we cannot overlook of present times fashion is our cultural apparel. Being in style is something which we would love and enjoy doing each time every time. Indian woman are generally not stylish but their elegance is enough to explain a lot in less. You may be able to solve most of your problems of wearing “what” on “what” occasion by completely relying on your Indian ethnic wear. With a lots of choices for you in apparel, you will look at your best in the Indian ethnic apparel known as saree. There are hundreds of designer saree to buy online in India and you would love to have a look at it. There is no dress in this world than saree that can show you how to look extremely gorgeous. It is in the last few years that the trend of this saree has changed like anything. Indians wear it in different ways and all of them look absolutely fabulous. The fast changing lifestyle has still not been able to affect the beauty and elegance saree showcases. These are the times when you feel that nothing is better than a saree. 1. You need to understand the frame of your body if you want to select the traditional wear such as sarees – If you are a quite plumpy and have fats deposited around the sides of your waist, then it would be better if you do not wear sleeveless cuts. There are the dark colours that can be chosen and you can better avoid the lighter shades. Then there are prints that are vertical in line and are small. They give woman a gorgeous slim look. There are women with heavy built and it would be better if they avoid kota and cotton sarees. They can instead go for Georgette and chiffon sarees. If you have a medium built then there are fawn and beige that are considered as the best colours whom you will love to wear. 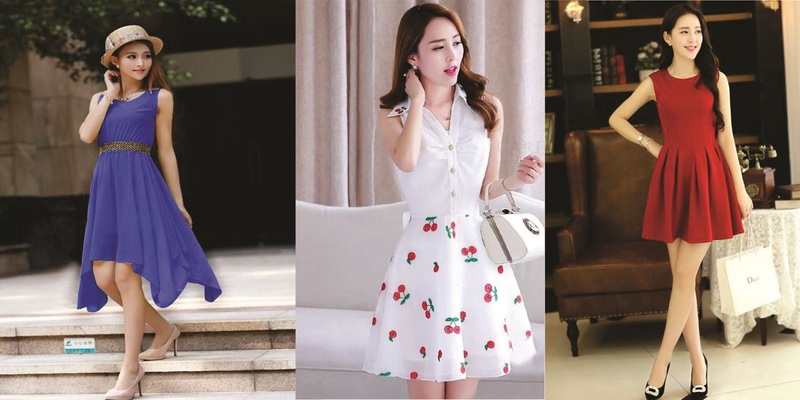 If you are trying to search blouses, then you can look for net material blouses that are extremely beautiful and you would absolutely love them for their elegance and incomparable charm you would find. 2. You can wear colours that look great on your skin tone. There are Indian women who are fairly gorgeous and they can try a number of shades of copper and gold. If you have a wheatish or dusky complexion then try making the concoction of white, bronze, beige, and gold. They are extremely beautiful and look perfect. Darker complexioned women can really appear at their best in copper and golden shades and colours. 3. Your self-confidence is perfect to carry you from your jeans to sarees – yes it definitely is! If you think that buying only from a reputed designer will make you look great and flawless, then let me tell you that you are absolutely wrong. You can equally and in fact, you can flaunt your beauty and poise in traditional attire more than you can do in the western attire. Find some of the latest designs on the most popular websites such as the Facebook or Instagram.